I have a hard time to understand why this film is labelled under “Berlinale Classics”. In 1957 when Tokyo Boshoku had it´s premiere, almost no one neither in Berlin nor elsewhere outside of Japan had even an idea that Ozu existed at all. But than it is probably meaningless to think about the quite dumb use of a strange Neo-English which dominates the language of the Berlinale administration. But shall I complaint if something like a rare masterpiece by Ozu will be screened? Tokyo Boshoku is Ozu´s last film in Black and White and the reason why he worked after since 1958 only with colours is well answered by this bleak film itself. The first thing which comes to my mind whenever I think about this film is the theory about the death of the universe by freezing in a very far distant future. The world of Ozu´s film itself seems here under the threat of death by freezing. Unusually for Ozu, Tokyo Boshoku is almost without any humour and whenever something like a gag appears a laughter will soon get stuck in the middle. Tokyo Boshoku is here a bit like Hitchcock´s Vertigo, at the first sight a typical theme of it`s director but at a closer look a very melancholic reflection. It is winter ( a not so popular season in a film from his postwar period). The cold is omnipresent in the whole film. It is the perceptible cold but as well an analogy to the frostiness of the relationships between the characters. Whenever in most of Ozu´s films pubs, bars, or restaurants are frequented it means fun, social life and laughter. In Tokyo Boshoku it is only a place to get warm for a while – it is nothing more than the last reflex of the instinct of self preservation. A fat elderly man drinks tea. At first he looks like one of his funny supporting characters. But a few seconds later we see on his face traces of a hopeless loneliness. The world of Ozu we know and which we even recognize here for moments seem slightly distorted. To use another analogy from the astronomy. The characters in this film seem moving away from each other like the galaxies in our known universe. Each dialogue seems to take an endless effort and if there is any film in which you feel the silence, a cold and deadly silence than it is Tokyo Boshoku. The background music, mostly happy bar music increases this feeling even more. The balance of most postwar films by Ozu between humour, poetic observation of every day life and melancholy is broken here for the benefit of a breeding sadness which is hard to define and hard to bear. Each of the characters is almost isolated with their losses. The parents are divorced, the eldest daughter thinks about leaving her drinking husband, the youngest daughter is disturbed and confused. This constellation of a totally dysfunctional family does not promise anything good. To understand early Japanese cinema but as well the old masters who worked in both of the great zeniths in Japanese film history, it is important to know that the cinema of this country has a lot to do with the Westernization of Japan. Ozu himself belonged to artists and intellectuals who experienced influences from America or Europe as liberating and inspiring. His passion for American cinema is legendary. This monstrous mixture of a former military dictatorship and the raising of a new westernized capitalism is the society´s self created monster. Even though Ozu´s civil courage during war and military government is as well legendary and even though I do not follow the interpretation of Chishu Ryu as Ozu´s Alter Ego, Chisu Ryu´s father is is one of his most unusual father figures. It is one of Ozu´s films which is as well a baseline study of Ozu´s generation. Ryu´s father is part of Ozu´s generation responsible (if not personally but as a generation) for both the war and the new economy and alienation following western patterns and that makes Tokyo Boshoku one of the most self reflecting films Ozu and probably the whole Japanese cinema ever created. A small hint suggest that the father´s marriage is destroyed by the consequences of the war. Beside so much other things, the film is also a process of coming to terms with one´s past. I can´t say that I love Tokyo Boshoku as much as Tokyo monogatari, Banshun or especially Bakushu, but it is definitely one of his bravest film and probably one of the bravest Japanese film ever made. It might be often hard to bear in it´s drawing of desperate loneliness and alienation. 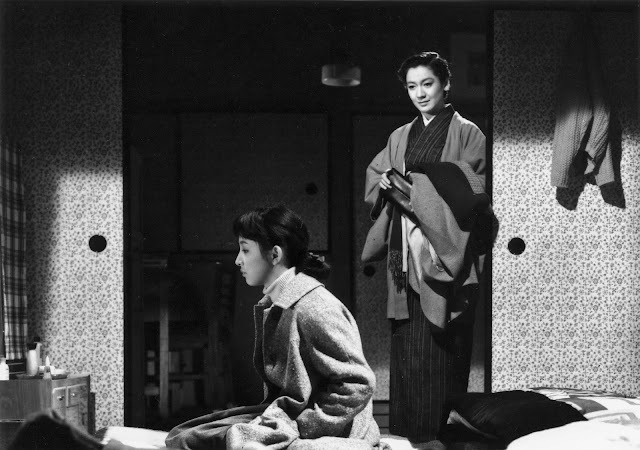 A small subtle moment reveals the dark and for Ozu unusual pessimistic mood. During an argument the father has with the youngest daughter, he says in anger:” You are not my daughter” In a film by Ozu this sentence from a parent is like a death threat or a verbal abortion. If ever a film by Ozu scared me than this extremely sad and abysmal masterpiece called Tokyo Boshoku.